If you want to create your own word cloud, go to wordle.net and copy and paste a block of text, RSS feed or blog URL. To make my cloud, I copy and pasted tweets from the responses on Twitter into a text editor, spell-checked and deleted the twitter handles and then copy and pasted to wordle. 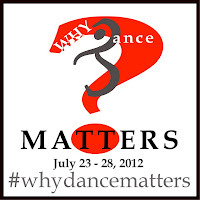 Share why dance matters to you in the comments, on Twitter or on the WDM Facebook page.